It’s been a while since I posted and can’t believe that it’s already the middle of March and we’re getting ready to turn the clocks ahead tonight. Here in the Boston area we had a taste of spring earlier this week, but we’re getting ready for rains non-stop all weekend. It’s been a busy time for me and lots of craftiness going on in February. I spent part of a weekend at a crop with friends and also had a fun Saturday with my sister where we played with embossing and stamping. Recovering from a cracked rib that happened the end of February, which has really slowed me down. I had another meeting of my Stamp Club and I thought I’d share one of my favorite cards I created in February for the sketch challenge. I used the Cupcake with Sprinkles rubber stamp by Karen Lockhart. This is so versatile as you can use it as a birthday, thinking of you or Valentine’s Day. I used a pink card base and some My Mind’s Eye paper that I had in my stash along with a Basic Grey piece of dollie paper that I cut for “one.” I colored with my Copics (shades of purples, browns for the wrapper and pinks for the hearts) picking up the colors in the background paper. I cut out the cupcake leaving a little bit of white around the edge and used foam tape to pop it up. I used a piece of the card base to stamp the saying, also by Karen Lockhart and tied some fun fuchsia sheer ribbon by May Road and added purple Stickles on the dots of the saying along as well as on the dollie corners for a finishing touch. I stamped using Memento Tuxedo Black ink and added Glossy Accents on the hearts after coloring them. This is just one of the card designs I did in February and will share more in future posts. It was a creative month, which in the middle of winter, what’s more fun than coloring with markers, stamping and creating? I can’t think of anything better to do. Thanks for stopping by and hope that you check back again. I’ve got some project ides for some cute Easter/spring cards and favors, which I’ll post soon. 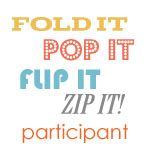 In the meantime, remember to turn your clocks ahead tonight and do something creative this week-end. This year I decided to bring my card making and stamping to a new level. So, I signed up for the Stamp Club at Colorful Creations, a local scrapbooking store in Hyannis, that meets once a month. I think it’s worth it as it will help push my creativity to a new level. It’s also fun to meet new people who share your love of stamping, get inspired and see what other people come up with interpreting the swaps and challenges. Doing the monthly card swaps will help me try new things and push me to do things I might not. This month was the first meeting where we did a Valentine’s Day card swap. Here’s the card I did. 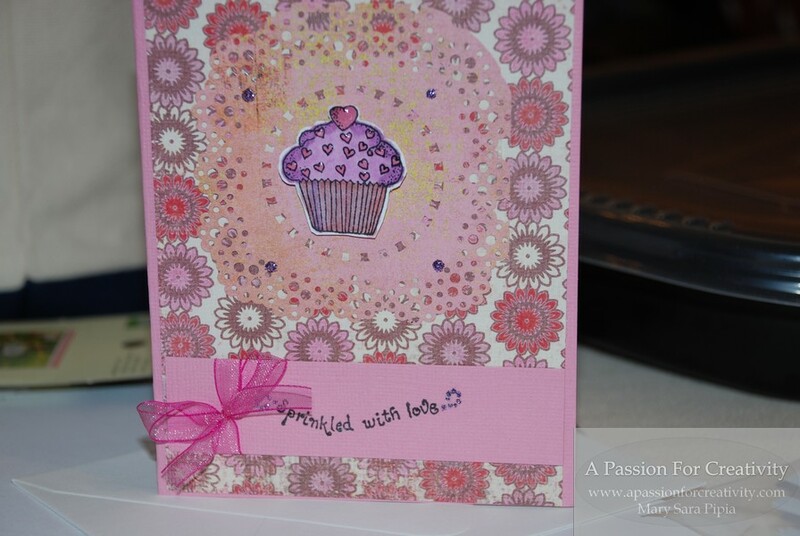 I used a pink card base and layered brown Bazzil cardstock and Memorybox SC-Coolbeans stripped paper as the base. I also used the Memorybox Branch Heart rubber stamp, that I fell in love with. I stamped it in the Memento Rich Cocoa because I thought I might color it with my Copics, but didn’t. Instead I used my Quickie glue pen on parts of the heart and then added Hot Pink Sparkly Fluff that I discovered when Tim Holtz used them on his 12 Tags of Christmas. I love this stuff. It’s fluff with a sparkle and it’s very easy to use, a tad messy, but worth it. To finish the card, I hole punched two holes at the center of the heart on the top and put through some hot pink May Arts pink silky ribbon and tied a bow with tails. I thought it needed something else, so added three brown glittery pearls in the lower right hand corner. Inside I just stamped Happy Valentine’s Day. Are you doing Valentine’s Day cards? I’ll post more Valentine Day projects that I’m working on in the next couple of weeks, so I hope that you check back again. Thanks for visiting and remember, do something creative today.